There has been endless discussion about the towering rise in inequality within countries around the world, notably in "Anglo-Saxon" countries. The reasons for it cited are myriad: labour market processes, education, race, gender, culture, technological change, personal preference for work, leisure and risk, and more. "The share of the very rich appears to be extremely responsive to changes in marginal tax rates. Over the period 1970-2000, we estimate that reductions in tax rates can explain between one third and one half of the rise in the income share of the richest percentile group." As a reminder, outcomes of inequality are important too, of course: note in particular the book The Spirit Level, which demonstrates how a wide array of social outcomes are associated not with absolute levels of wealth or poverty, but on inequality. Following on from Alex's comment on undeclared income, a similar issue applies to undeclared wealth. Statistics on personal wealth already show a massive concentration of wealth in the hands of a tiny elite in most countries. But do the statistics tell the whole story? Judging from discussions with World Bank officials and others, wealth statistics do not capture wealth held through legal structures, including trusts, offshore companies and such like. This being the case, levels of inequality are likely to be much, much higher in most countries than the already appalling position described by the official statistics. Correlation does not imply causation. Repeat 100 times! 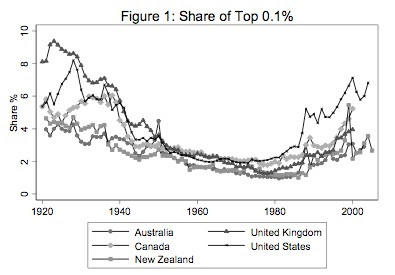 A) Reductions in marginal rates cause the rich to take a higher share of a given economy. B) The very rich are more successful at causing marginal tax reductions the greater the share they have. C) The very rich migrate away from places with high marginal rates of tax. The problem is that these different interpretations suggest different policy responses. (D), for example suggests lowering marginal rates, whereas (A) suggests increasing them (assuming a bigger, more evenly distributed economy is better). So the data in the paper don't give guidance as to how to improve the tax system. The right approach is via economic modeling (simulation) and testing. Taxing people who collect rents "in their sleep"
Ireland's growth - miracle or mirage?